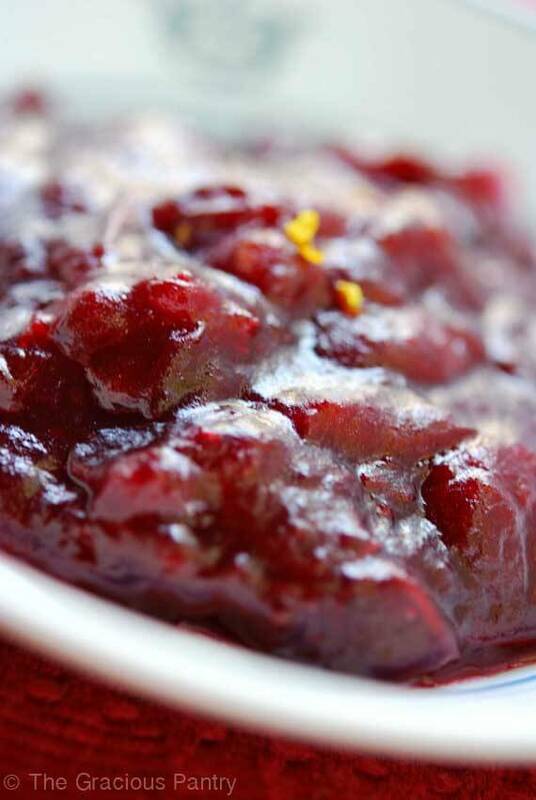 This clean eating cranberry sauce is perfect for your holiday table! 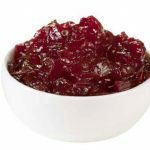 This is, hands down, the BEST clean eating cranberry sauce recipe ever. I mean it really puts the store-bought stuff with refined sugar to shame. I’m so excited to share this recipe with you! And did I mention it’s easy to make? Yep! It’s an “all-in-one-pot” dish. So grab that pot, and let’s get started. 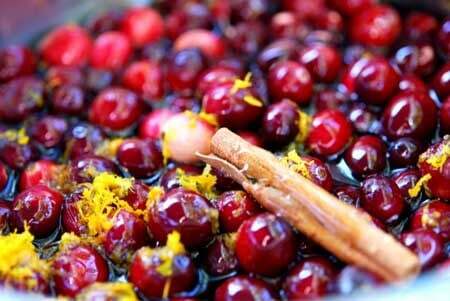 This delicious cranberry sauce will be on your holiday table for years to come! Put everything in a pot, and turn your stove on. Phew! That was tough, wasn't it? Seriously, that's pretty much it. Cook over a medium-high heat for about 30-45 minutes. When most of the liquid is cooked out, turn your stove down to a simmer. The longer you let this simmer, the thicker the sauce will get. Just don't let ALL the liquid cook out or it will burn. Stir more frequently near the end. What’s the scoop on agave syrup? I googled it and got some conflicting info. It seems to be high in fructose, low in glucose. My understanding is that honey is as well. Now 30-35 years ago honey was being hyped as good for diabetics to eat because of the fructose/glucose ratio. But high fructose corn syrup has turned out to be a really bad thing for those of us at risk for metabolic syndrome/pre-diabetes/type 2 diabetes. So how is this different? Agave is definitely a clean food like honey. What I like about agave is that it is low on the glycemic index. Which means it has far less of an impact on the blood sugar than honey. I’ve also found that it has less of everything else too. Fat, carbs, and calories. While I do still use honey on occasion, I find that agave does everything I need it to do without causing my blood sugar to spike badly. That said, you still have to eat it in moderation. I wonder how it would be if you just skipped adding any sweetener and used the juice and pulp from that orange you just zested. I also wonder if it would work instead of the canned stuff in the tomatoless catsup I make for the big man of the house. I cut the sugar way back from the recipe I found online and left out the corn syrup altogether. But there is still quite a bit in the brand cranberry jelly. Seems to me the nearer things are to the way God made them, the better they are for us. I guess I need to do more research. I’m still not convinced any other sweetener is better for us than minimally processed organic sugar in moderation, of course. Agave is a natural sweetener. It’s taken from the agave plant. I tried making it without the agave and it was just to tart for my tastes. But you could certainly try it. Maybe if you used frozen concentrate instead of prepared juice? Let me know how it turns out for you! Hi ~ thank you so much for getting me the link and ofcourse sharing yet another awesome recipe with us!!! You ROCK! One quick question ~ do I have to used distilled water? Thanks again =o) Happy Thanksgiving! Dawn – Use the best and cleanest water you have. Distilled just happens to be the type of water I use. Enjoy! Made this on Thanksgiving and also a traditional full of sugar one. I told my family the difference between the two and almost no one wanted to try the one without refined sugar. I made it again on Christmas but did not say a word about using agave instead of sugar and it was GONE. Everyone loved it. From now on I will cook the way I want to and not let them know it is actually good for them. Leah – LOL. Yes, sometimes that’s the only way to do what’s best for them. I’m happy you liked the recipe! How long do you think this would keep for. I would like to make it a day or two ahead of time. It should be ok… right? Thank you for the ratio of agave. I was needing to know that. Also I really love using the orange juice from the orange I have zested, do you think I should lower the agave? I also add a few cloves, star anise, and a cardamom pod. PRowton – If you lower the agave, I would only do so by about 1 tbsp. Enjoy! Blakleigh – You can! Just keep in mind that maple syrup may not have the intensity of sweetness that honey or agave will have. So you may end up needing to stir in a bit more to compensate. But it should work just fine. Enjoy! Erin – Fantastic! I’m so happy you enjoyed it! I’ll be making a batch myself tomorrow. Yum! Yes. Definitely in the fridge. Just put it in jars first and put a towel down on the fridge shelf. They’ll be hot. You can wait till they cool a bit first before putting them in the fridge if they are too hot to touch. I would love to make this for Thanksgiving this year, as my husband loves cranberry sauce- but he will insist that he will only eat the smooth canned kind! 😛 Is there anyway to make it smooth? strain it? I’m afraid he won’t try it! Try putting it through the blender. It might not be completely smooth, but you should be able to get it pretty close. Try a batch ahead of time and ask him what he thinks. Is the agave the same ratio as the honey? I didn’t. And if you do, I would blend it AFTER cooking. Not before. Yay! So glad it worked out! i dont have a cinnamon stick..do you think I could just use like 1 tsp of cinnamon? I would only do 1/2 tsp. Otherwise, you’ll get a grainier texture. Do you have to use distilled water? No. Any water is fine. I wish I had this recipe for Thanksgiving Dinner, this would have been a help but I will have it for Christmas Dinner, another recipe for keeps! Does anyone know anything about coconut sugar. I was told it was a healthy alternative and tasted like brown sugar? Thank you SO MUCH for this recipe!!! My 5 year old Grandson LOVES Cranberry Sauce, and asks for it every time he’s here. I cringe when I buy a can because of it’s ingredients. Will bake him a batch to have when he gets here tomorrow. Thanks again! Back again lol. Seems I fall back to your site for everything and well as the holidays are coming it seems I visit quite often. If I wanted to make a big batch to can could I make it in the crockpot? Although I know you’ve said you don’t have a plether of canning information, Would you consider this a cannable recipe? Lexie – I would not consider any of my recipes as canning recipes. None of them have been tested as such. But this does freeze well if that helps. You could try the slow cooker, but I’m not sure it would fair well. The water needs to reduce and that’s difficult in a slow cooker. Our family has a similar recipe that includes pineapple and pecans. Canned pineapple jells well and adds sweetness to help balance the tartness. And we love chopped pecans in it! Love this and your site! It is making Thanksgiving planning much easier. Thank you! I just made this for Thanksgiving tomorrow. Is it to be served chilled? Chrystal – Either way. You can serve it warm or cold. I typically serve it cold just because that’s what I’m used to. Paula W – My pleasure! I, for the life of me could not find cinnamon sticks. Can I use powder cinnamon instead and if so how much? Thanks! Ryshel – Sure! I would say about 1/2 tsp. This recipe looks delicious! One thing though, I’m not sure why there was discussion of agave syrup; I only see honey or maple syrup in the ingredients list. Should I add some agave syrup as well? Jacinta – About 3-4 weeks, give or take. Maria B – My guess would be about a week, give or take. quick question: can I make this with frozen cranberries? Thank you for this AMAZING, simple, nutritious recipe. Just made it for Thanksgiving tomorrow and am tickled! This came out amazing!!! But I found I to be a bit too sweet for my liking (and I do enjoy sweet lol). I wonder if it’s because I used a small clementine zest instead of an orange?